Both new Keboola Connection and old version has been available for some time side by side. Old version was keep alive due to included Facebook token verification, this feature has been moved to extractor. There were no another reasons maintain old version longer, it was shut down today. Table can be exported to Files Storage. Read more in documentation. We had to rollback transformation API, during bug in rollback some transformations failed and ended with HTTP error 500. We’re slowly rolling out support for transformations on Amazon Redshift. Both Transformation API and UI are undergoing slight changes you might notice. If you’re interested in using Amazon Redshift in your stack, contact support@keboola.com. File Uploads are heavily used for data exchange between Storage API and other components, import backups, etc. These kind of data may not be kept forever. From now all files are stored for 6 months by default. File can stored permanently by using isPermanent parameter. Several orchestrations started after 13:00 CET (4:00 PST) got stuck due to bug in GoodData Writer. They are being killed just now and restarted if needed. We apologize for any inconveniences. Files API can provide temporary AWS credentials for file upload or download. Use the federationToken parameter for upload and for download. It is handy for integration with other AWS services such as Redshift, you can also utlize existing AWS SDKs for file uploads. 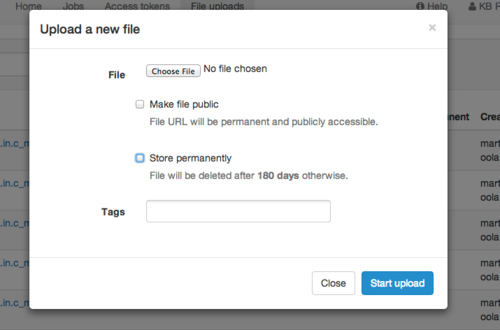 File uploads backend has also been migrated to Elastic search, expect search and tagging capatibilities in near future. There’s a new extractor you can use from the Keboola Connection’s Extractor tab. It serves for extracting call log from Telfa into Storage API. If you set the filter to “from”, which is a date since when you want to extract calls to auto, it will automatically load all the calls initially, and all the subsequent runs of the extractor (using the same configuration, of course) will extract calls since the previous execution (with a minimal overlap).